English merchant and philanthropist; born in London 1823; died in Liverpool Dec. 4, 1885. Settling in Liverpool in 1840, he by 1856 had accumulated sufficient capital to commence business on his own account as a boys clothier in Bold street. Subsequently he opened a second establishment; and thereafter he gradually developed one of the largest retail businesses of the kind in England, erecting an establishment of the "Universal Provider" or department store class. Similar ones were founded by him in Manchester, Sheffield, and Birmingham. No firm in the provinces did more than his to bring cheap and durable clothing within the reach of the masses. Lewis' ample means were freely given in aid of charitable and philanthropic works. He headed the local subscription list for the persecuted Jews of Russia with a donation of £1,000 ($5,000), and gave large sums in support of the synagogue. For many years he held the position of warden and treasurer of the Old Hebrew Congregation, Liverpool. 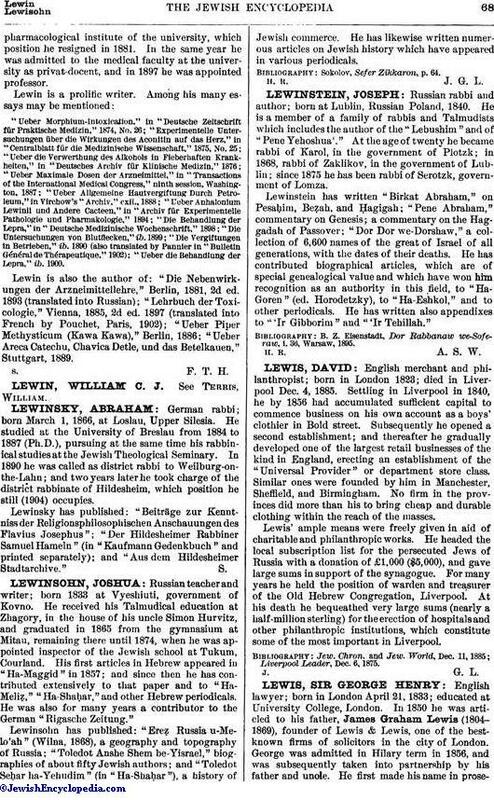 At his death he bequeathed very large sums (nearly a half-million sterling) for the erection of hospitals and other philanthropic institutions, which constitute some of the most important in Liverpool. Liverpool Leader, Dec. 6, 1875.